The good news today is we are all feeling better. Molly is still fighting a Upper Respirtory Infection, but the rest of us have survived. Why is it when you are sick you feel like you will never be well again? 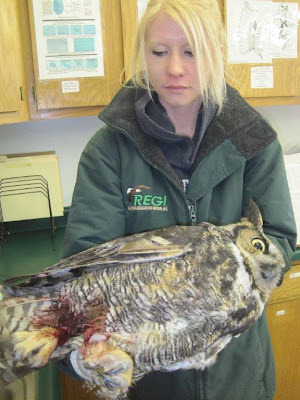 Sad news last night when DNR Warden Jim Horne brought in a Great-horned Owl that had been caught in a leg hold trap meant for a fox. It is a beautiful young male owl. 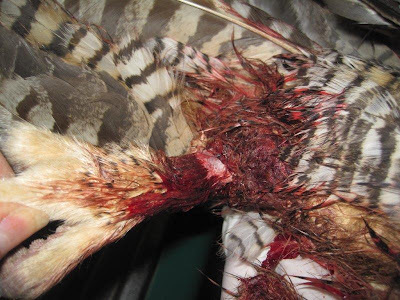 Jim took the owl from the trap himself and wrapped it in his jacket in an effort to slow the heavy bleeding from the leg. That is dedication. 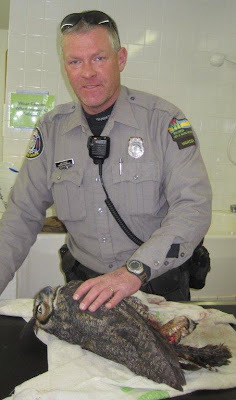 The State of WI is blessed to have great wardens such as Jim looking after our wildife. The owl is resting quietly now. He was given fluids to try to replace the blood loss. We will have to wait and see how much circulation to the foot has been compromised. There is some discoloration now, but hopefully we can save him. He is still in shock but we are always hopeful. The leg itself does not appear to be broken and that is a good thing. A group of Snow Buntings appeared yesterday. I couldn't help but wonder if the little one we released last weekend was among them. 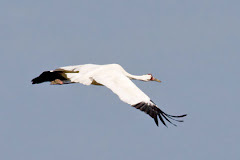 They are preparing to move north for breeding. With all the snow and cold temperatures in the southern part of the U.S., I worry about the birds that are beginning to think about coming back to their natal area for breeding. That is all for today. We have lots to catch up on after having a week of flu.